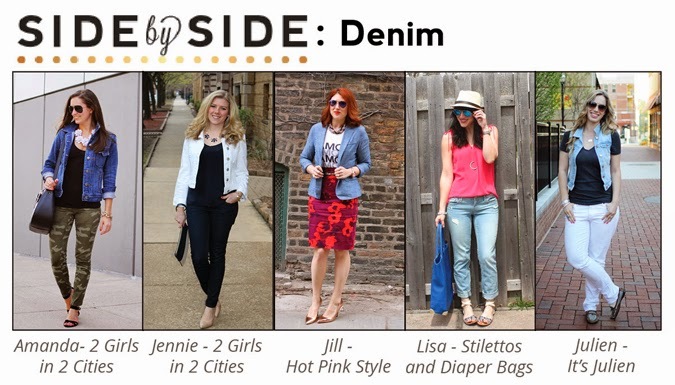 Today I'm doing a fun collaboration with three lovely Chicago bloggers and two DC bloggers! We all styled denim in our own way. From dressed up for work in a pencil skirt (guess who?) to Lisa's cool and casual weekend look, denim can work in just about any situation if you pair it right. Don't you just love the versatility of a denim jacket or vest? I must say Julien's look is making me want to dig out my old jean vest and make it work with a skirt for work! For details, click through the names above to visit each of their blogs. If you are looking for my outfit details you will have to stop back later this week! A full report and a little surprise will be included! Thanks again for joining us for the Side-by-Side! We love your work-appropriate denim. Love your look for this challenge! Blazers are my fave and I love how you paired it with a floral skirt (two major spring trends!) And my jean vest was only $30 at H&M and it's been such a great piece to tie together an outfit!